It’s been my second GameDay conference and I want to share my feelings about this one and also compare with the previous one. Remarks about GameDay 2011 conference you can find in my other post. This time, the conference took place at Expo Silesia. Pretty big place for such a tiny event. Last time, it was at Silesian University and the number of participants was able to cover most part of the seats. This time, lots of empty seats were looking a bit strange. I think that the number of viewers comparing these two events was roughy even, but the feeling was much different. iOS 5 Tech Talk – What it was about? I had opportunity to be at iOS 5 Tech Talk in Berlin (November 2nd). Ride to Berlin with my car took about 5 hours. After a night in hostel I took a subway to city center where Maritim ProArte Hotel is located (2011 iOS 5 Tech Talk location in Berlin). Throughout the whole day (this conference took only one day) waiters served food and drinks. Nice, but lets focus on presentations. 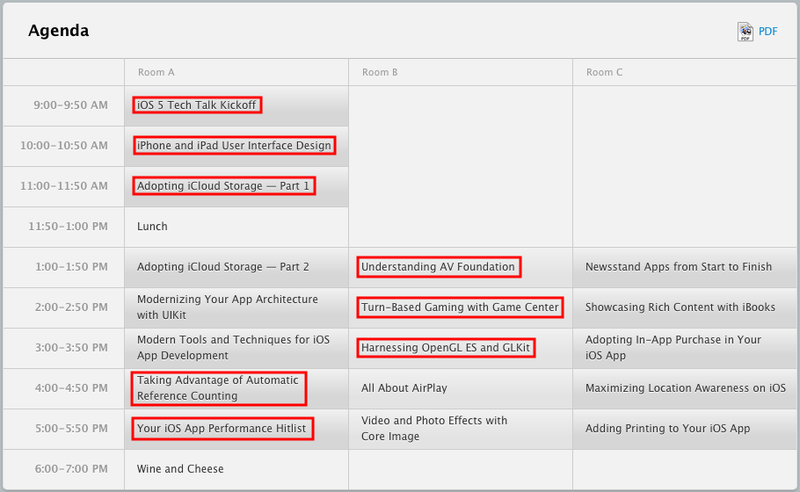 Here is the whole agenda with marked presentations that I choose (during most of the day there were 3 parallel presentations). I thought I know much about Test Driven Development (TDD) and Pair Programming. After attending CODERETREAT organized by Software Craftsmanship in Krakow I know that I was wrong. Theory is something totally different then practice. This event was facilitated by Corey Haines, one of the inventors of this type of exercise (more info about it at this page). He encouraged us to use four elements of simple design, what really increased code testability and made it readable. He was also giving us really good hints during and between coding sessions. Next day I looked at my current home growth projects and realized how much can be improved there. Software developer is always learning. When one thinks that he knows enough, he just don’t know that he is wrong and need to learn much more. Couple of days ago I was at AGH University in Krakow listening to Adam Sawicki’s talk about “Pitfalls of Object Oriented Programming”. This event was prepared by SKN Shader (group of students programming computer games). Speech was interesting, but really short (1 hour only). Adam was talking about pitfalls we can fall into when over interpreting object oriented programming principles, i.e. wrappers which in the end of the project looks like things that we were trying to wrap, but we failed or usually wrong use of singleton pattern. One thing really interested me. It was data-driven design. This concept is focused on data processing optimization which is highly used in computer games development (because of this focus on optimization). I don’t know much about it, but for sure its worth reading. Some information you can find on Adam Sawicki’s webpage.